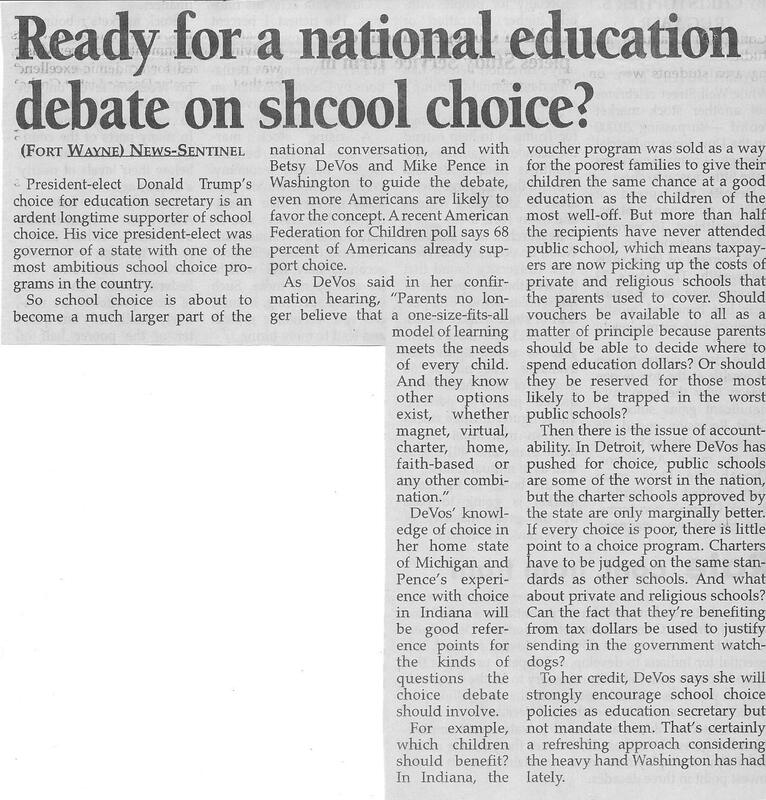 There’s something sadly funny about an article discussing the quality of schools that misspells school in the title! Geez! That’s a bold face headline for crying out loud! I don’t know if the mistake is from the original article or the reprinting in the Pilot News, but either way I think it’s a bit embarrassing. Spellcheck anyone? I seem to be in the minority of people bothered by these things. The other day a tweeted a sign I saw. (here) I had to say something to the manager. Their first response seemed to be irritation at me. <sigh> At least they did take it down. It was one of four that had personnel spelled incorrectly. 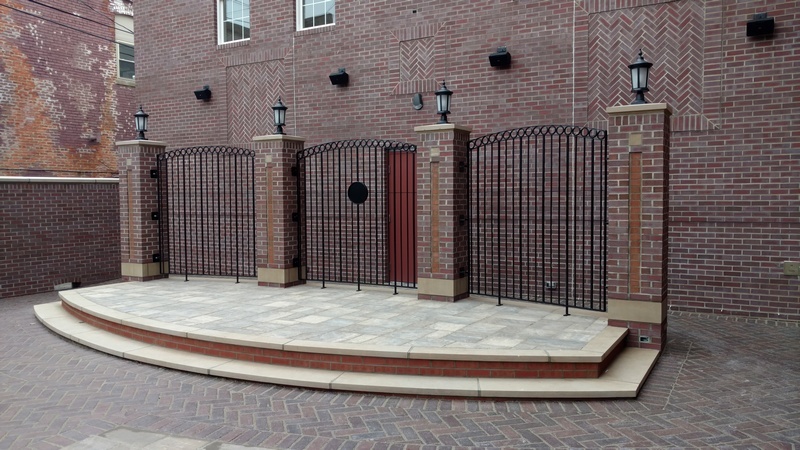 The gate for the courtyard was installed last week. Schlemmer Bros did an excellent job with this. We were particularly pleased with the medallion they created. They originally created the one to cover the fireplace vent (pictured here) at the NE corner of the courtyard. We and the Owner liked it well enough that we asked them to create another one for the entrance gate. 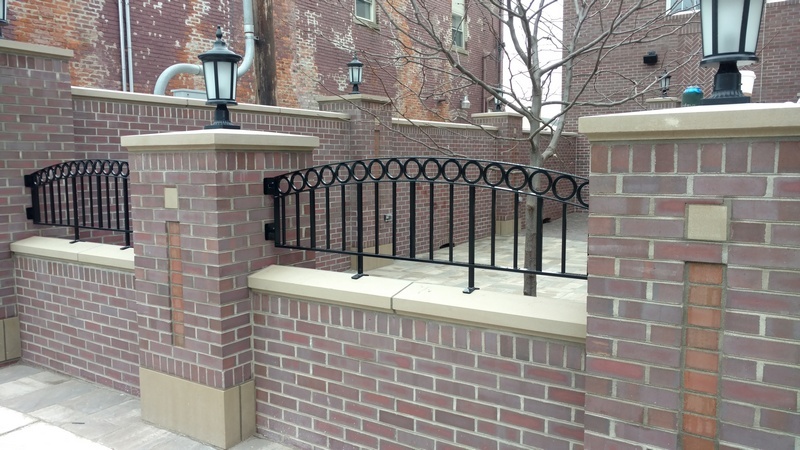 We think it gives a touch of class and modern appeal to the classic wrought iron and brick installation. 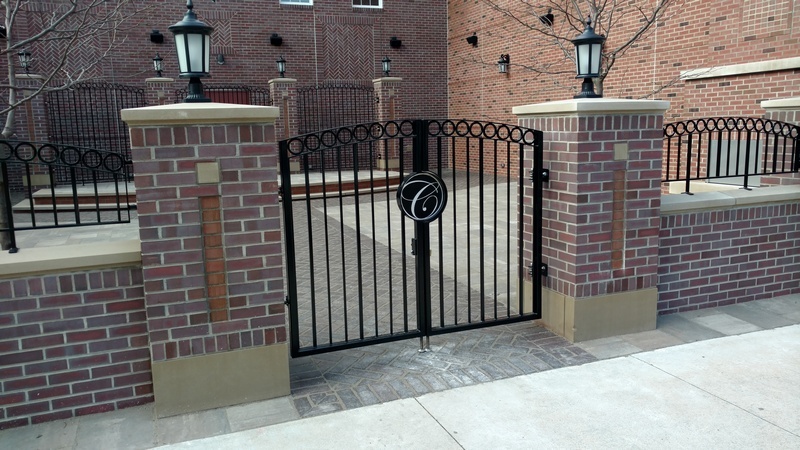 The gate was installed with a concealed locking system behind the medallion. The gate has drop down rods that will strengthen it in the closed position and also hold it open at 90 degrees during during events. The medallion and locking concept was the vision of us at Easterday Construction, but kudos to Schlemmer Bros for making it happen! 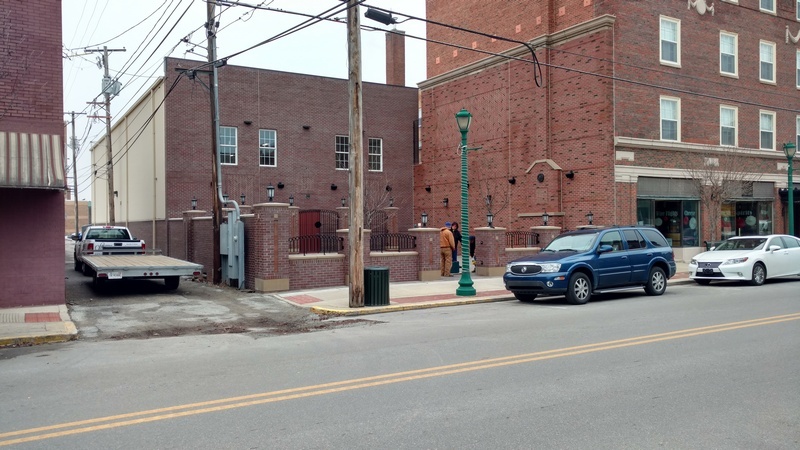 Schlemmer Bros. were on site last week installing the wrought iron work for the Charley Creek Inn Courtyard (see right). I tweeted some pictures of the wrought iron under production at their shop here. This is one of the final touches for the courtyard. It will be ready for use this Spring as a venue for weddings, concerts and other gatherings. Miami Street is also where Wabash holds their First Friday events, so the courtyard maybe come a central fixture in that. Below are some detail pictures showing the railing on the wall and dais. 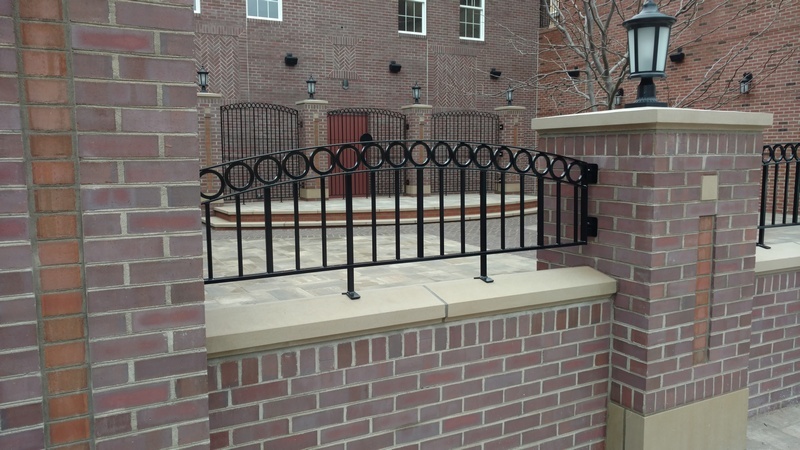 Wrought Iron installed on Dais at Charley Creek Inn Courtyard. An identifying logo will be installed in the center medallion soon. Wrought iron installed on the north portion of the perimeter wall. Charley Creek Inn Wrought Iron installed on the south perimeter wall. The iron is anchored to the brick and sits on the limestone. 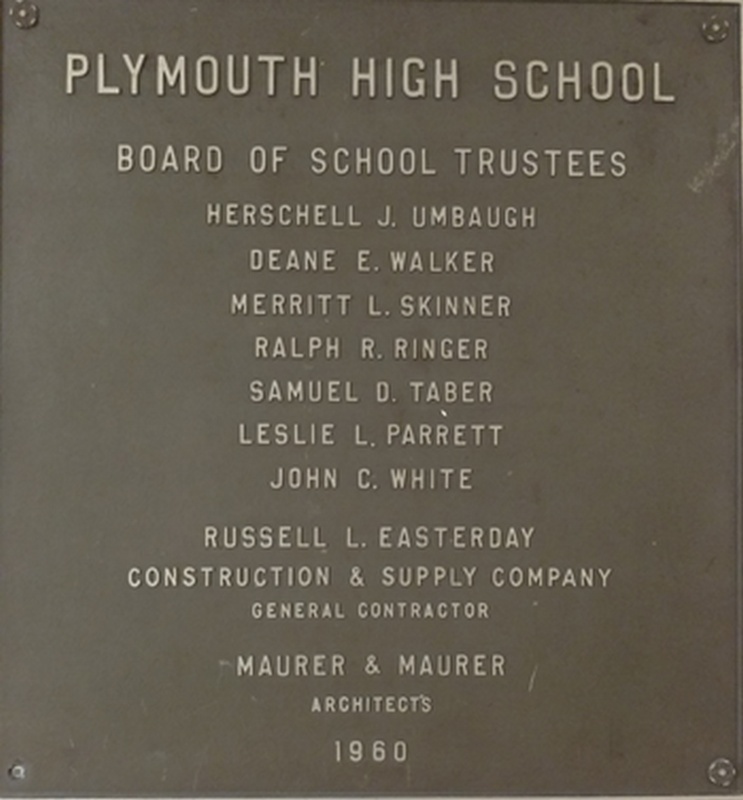 I got called to the principal’s office at the Plymouth High School the other night and ran across this dedication plaque. This is a project that was completed by Easterday Construction before I was born! Actually, I think this is before Dad was back with the company. I don’t think he returned to work at Easterday Construction until 62 or 63. It’s always interesting to run across these things. My great grandfather, Russell L. Easterday, would have still been alive and running the company at that time. As I understand the history, the office would have been at the current location on Slate Street in Culver. I would assume my great uncle Jack Easterday or possibly my grandfather, Bob Berger, would have been superintendent on the job. That’s just supposition though.